5 Ways to Waterproof Your Home! As fall approaches, leaves fall and begin to gather on roofs and in gutters. One of the best ways to prevent water entering your home is to make sure your gutters are offering proper drainage for your home. Wet leaves left on the roof can cause mold and a number of other damaging issues. If you have a really tall house or a steeply angled roof, it might be best to hire a professional to help you out! Various temperatures create different stresses on a number of elements in your home. Your concrete, like garage floor, foundation, or even house walls can begin to show signs of wear. In the summer, the heat forces the stone to slightly expand, while the stone contracts in the colder months. While it’s normal and expected, over time the fluctuations can be too much for the concrete. Cracks in your concrete are typically not too hard to repair (unless it’s in the foundation) but are necessary in maintaining the integrity of your home. If water seeps up from the foundation, it can ruin your floors, walls, and anything else the water may touch. It’s best to take care of these repairs quickly and they can be as easy as using a caulk gun and doing it yourself! Old window and door frames can be a huge culprit in allowing water into your home. If you own an older home, the sealant on wood can begin to wear down and expose the material to air and water. The elements can begin to break down the integrity of the wood, sometimes allowing water into your home. Sometimes, the fix is as easy as resealing the material, while other times it may take a full removal and re-install process. Your best bet is to ask a professional to inspect the wood to make sure it won’t cause you future problems. When we say ‘seals’, we don’t mean the wood trim and frame around the windows and doors. We’re talking about the rubbery material that creates an airtight seal around your windows and door. As most plastics and rubbers, they will wear down over time. The rubber can shrink and become stiff, hard, and holy, exposing holes in the seal. With these holes, water, air, and sometimes little insects can get into your home. Just like a windshield wiper loses its effectiveness over time, these guys should also be looked at if you’re having leakage around your windows or doors. Basements are typically the most common thing to flood in a home. There are many things that can contribute to basement flooding like cracked concrete, leaky washer & dryer intake, or old basement windows. Make the effort to check out your basement from time to time to make sure everything is properly sealed to keep everything dry! One of the things I love the most about my job as programming manager for DIYNetwork.com is discovering the things you love about us, but also the things you want to see. And long have I labored on a piping-hot laptop eager to fulfill a common desire among passionate DIYers: staircases!Let's face it, very few of us could add an interior staircase where there isn't one now or heavily remodel an existing one. 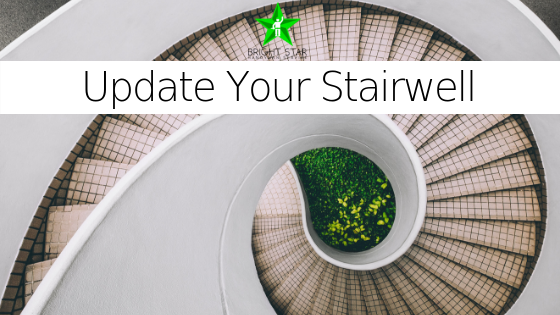 More approachable DIY staircase projects are utilizing them for additional storage or painting them. A wooden staircase, especially one that has lost its luster, can be painted with powder-room-esque gusto, as Shannon Kaye demonstrates here. Shannon's project — coupled with your response to it — caused us to dig around for more painted staircase inspiration, like Bryan Patrick Flynn's step-by-step faux runner and seven more colorful examples. Kitchen renovations are number one on the remodel list for 2018. Whether it's the large style shift, or high return on investment, kitchen remodels are on the rise compared to the last 2 years. What are some key components to creating the kitchen of your dreams and working within your budget? Kitchen style has varied greatly the last few years which could be a contributing factor as to why kitchens the most requested home remodel this year. While modern and traditional kitchen styles have been most sought after for the last few years, consumers are now searching for more transitional and farmhouse style kitchens. Kitchen technology is also advancing like any other room in your home, like appliances with greater energy efficiency updates. Stainless steel has been the top selection for appliance color for the last few years. Refrigerators are most commonly replaced appliance in the house. The average small kitchen minor remodel in the US runs about $14,000, while a major large kitchen remodel can average around $42,000. This wide range offers quite a bit of wiggle room for you to budget for your remodel. In Philadelphia, the average professional minor remodel of large kitchen runs around $28,200, while a major remodel will creep into the $50k range. Approximately two in five homeowners chose to begin a remodel because they could no longer stand their old kitchen, whether stylistically or functionally. The rest of the majority of homeowners stated they chose to remodel because they finally had the means to do so! 95% of homeowners will update their countertops with a kitchen remodel, closely followed by kitchen sink, backsplash, and metal fixtures like faucets. Engineered quartz is the top splurge for kitchen and bathroom countertops this year, followed by appliances and cabinets. Nearly half of all homeowners choose engineered quartz over granite. Stylistically, the most popular kitchen color choices are modern & minimalist. More than 40% chose white, shaker-door cabinets to be installed in their homes, while the number one color for kitchen walls is gray. The number one flooring material and color is hardwood, instead of tile or carpet. Many homeowners are able to cut costs on flooring installation, too. Across the board, the average size of a renovated kitchen is between 200-250sqft, allowing for more space in rural areas, and slightly smaller in urban areas. In 2018 specifically, there has been a rise in increased kitchen space during a renovation. This increased square footage can come in many forms. For example, many kitchens are being convented into an open layout, where walls or partial walls are removed to create more space. The second most popular way to expand a kitchen includes creating more outdoor space that allows the kitchen to spill out in nice weather. While there are always trends, there are so many ways to make a remodel your own. Bright Star Handyman Service is willing to work with you on a budget and create the room of your dreams! Reach out to our consultants today to learn more about your future project! Grab a ladder, and check your gutters for debris. Remove as much as you can with your hands (Don't forget to wear gloves!). Remove any leftover gunk with a garden hose. Take off any nozzle and have a helper turn on the water when you’re ready. Shove the hose into the downspout to power out of gooseneck bends. Make sure your downspouts channel water at least five feet from foundation walls. As much as the holidays bring friends and family together, a cheerful time of can often turn stressful when planning for the holidays. Consider these easy DIY tips so your home is ready for the winter holidays. There's no better way to start fresh than new bedding. Quick updates, even a new throw pillow, can quickly transform a space and make it perfect for your guests. A new rug, paint or decorations can quickly transform your entryway space, making it the perfect first impression for your guests. Consider updating your bathroom faucet or adding some holiday-themed decor to the bathroom space. Small fixtures and hardware are easy to switch out and give a fresh new look to your home. There's nothing wrong with cooking ahead of the holidays so that you have some extra family and friend time when the winter holidays come around. Consider cooking sides so that you have less to do when hosting guests. Save some time this holiday season with Bright Star Handyman. When it comes to bigger updates around the house, we are here to help. Bright Star Handyman will do everything from painting and refinishing cabinets to woodwork, carpentry and installing new backsplash. Bright Star has the expertise to get the job done quickly and efficiently so that you have more family time! Happy holidays! Check out this painting tips from Bright Star Handyman, Philadelphia's best handyman service! Carpentry is more of an art. The beautiful way of carving furniture has been in existence since the Stone Age when science and technology weren’t even born yet human being with their innovations carved out beautiful sculptures with hand. Carpentry nowadays has entered into the machine world where carpenters use machines to design and build an item. It’s a term associated more with wooden items, furniture and decors. Having the best designed furniture at your home can brighten up the mood of the room every time you enter. It’s therefore very important to have a well experienced and efficient carpenter to design and build your furniture. Not every home improvement is cosmetic. Deteriorating roofs, termite infestation or outdated electrical systems — you can't fix it if you don't know it's broken. Hire an inspector to check out the areas of your home that you don't normally see. They may discover hidden problems that could negatively impact your home's value. Small problems (such as a hidden water leak) can become big, expensive problems quickly; the longer you put off repairs, the more expensive those repairs will be. One of the simplest, most cost-effective improvements of all is paint! Freshly painted rooms look clean and updated — and that spells value. When selecting paint colors, keep in mind that neutrals appeal to the greatest number of people, therefore making your home more desirable. On average, a gallon of paint costs around $25, leaving you plenty of money to buy rollers, painter's tape, drop cloths and brushes. So buy a few gallons and get busy! New Backsplash. Bright Star Handyman Service. Philadelphia, Pennsylvania.